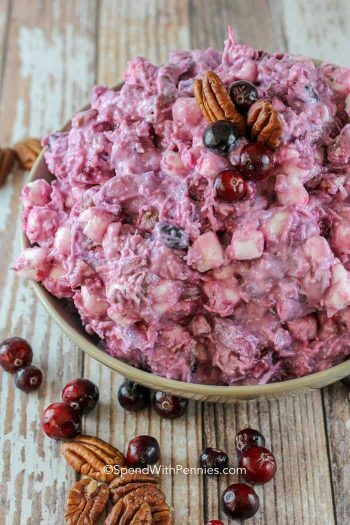 Ambrosia Salad has been a staple on our Holiday dinner table for as long as I can remember. 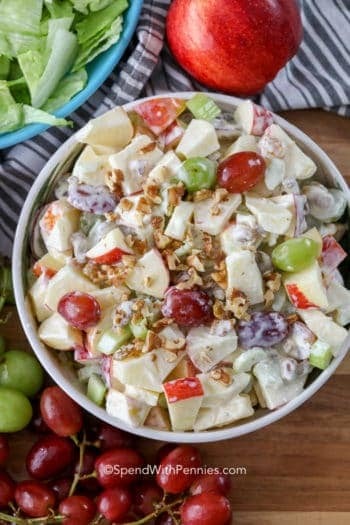 Traditionally ambrosia salad (also known as 5-Cup salad) contains coconut, pineapple and oranges but we add other goodies from time to time including maraschino cherries, walnuts, fruit cocktail and/or pecans! 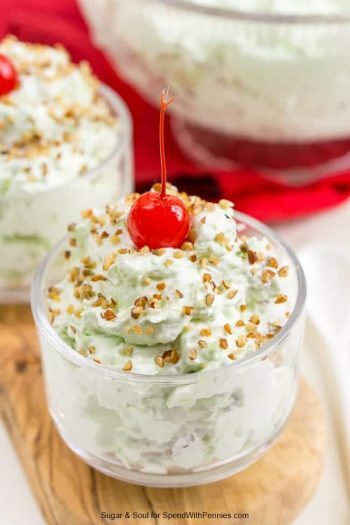 Similar to Watergate Salad or Millionaire Cranberry Salad this dish is more dessert like than an actual “salad” as we would know it. Church affairs, potlucks, or work functions, the ubiquitous ambrosia dessert always has a place on the table! At least everyone can agree that any classic ambrosia salad recipe will always have marshmallows. And who doesn’t love marshmallows? Even kids will want seconds of this delicious fruity ambrosia. 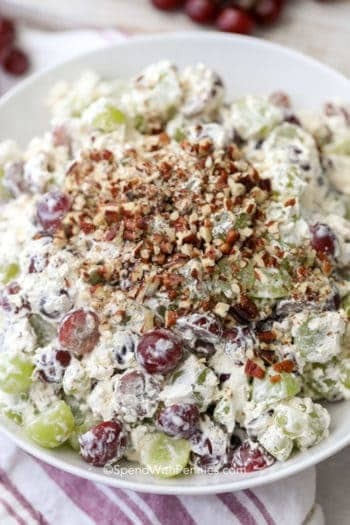 Ambrosia Salad is a great dish to whip up if you are short on time! 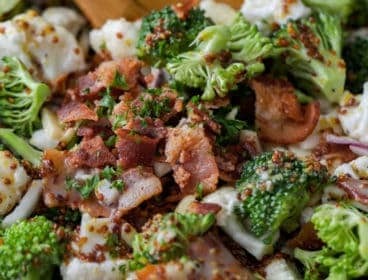 Be sure to make this salad ahead of time so it has a chance to sit, this helps blend the flavors and makes the marshmallows soften. 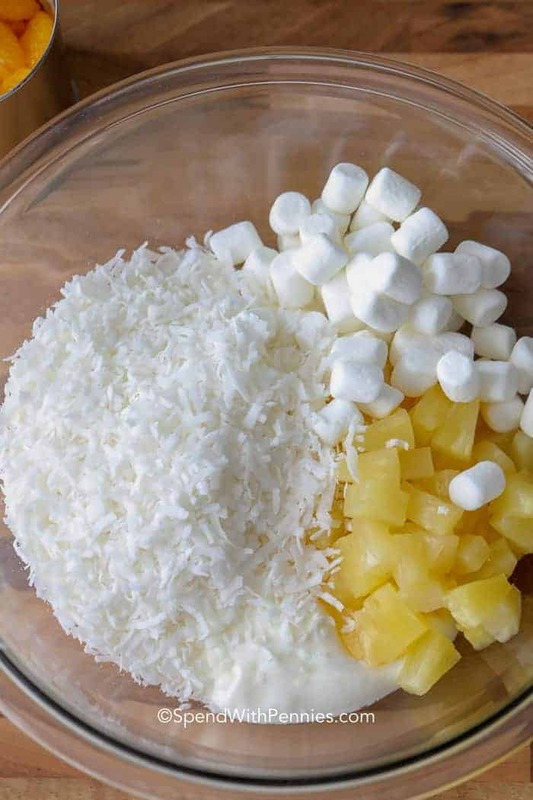 So, what exactly is that strange fruit salad with marshmallows? Is it a marshmallow salad or a fruit ambrosia? 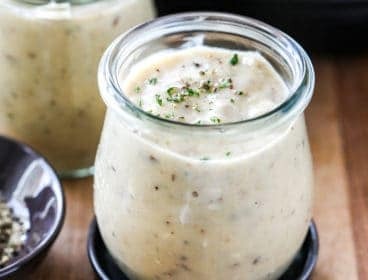 The jury on Ambrosia salad is definitely depending on where you live in the country and it is definitely different almost everywhere you go! 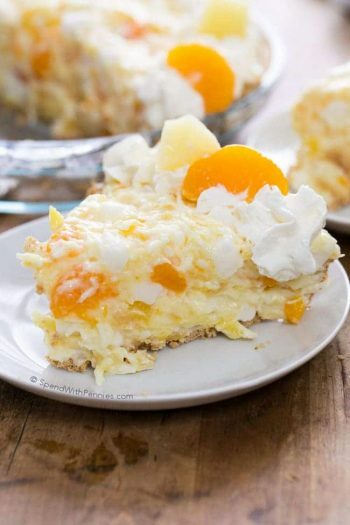 Ambrosia literally means ‘food of the gods’ but technically, it also means a dessert made with oranges and shredded pineapple. Some regions claim it is strictly a fruit salad blended together with mini marshmallows and coconut. But, other legions of fans claim it’s not legit without tropical fruits and nuts. 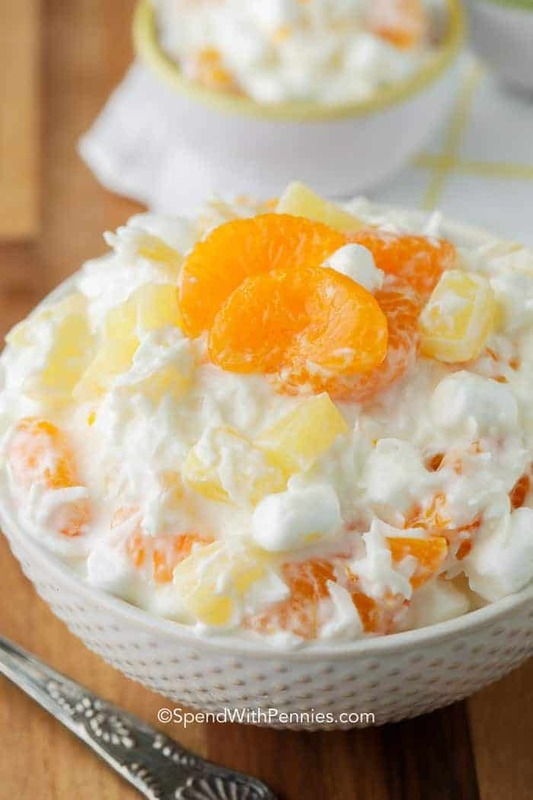 Mandarin oranges, pineapple tidbits, bananas, grapes, maraschino cherries and with or without nuts, ambrosia fruit salad has been a staple at nearly every social gathering you might attend. Ambrosia is a perfect complement to a hot summer day barbeque and traditionally served at holiday gatherings because it looks so colorful and festive. 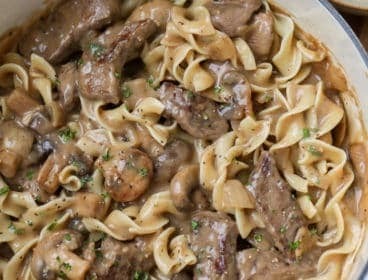 But, don’t feel restricted by the ingredients in this recipe, however. Feel free to add or swap out for maraschino cherries, bananas, grapes, or toasted walnuts or pecans! Toasting the coconut before adding to the salad really brings out the flavor of the coconut and adds a little crunch to this dessert! It is important to make sure the pineapple, mandarin oranges or maraschino cherries are thoroughly drained to make sure your ambrosia dessert keeps its light and fluffy appearance! The best part of this beautifully delicious dessert is that there are no real ‘step-by-step’ instructions. 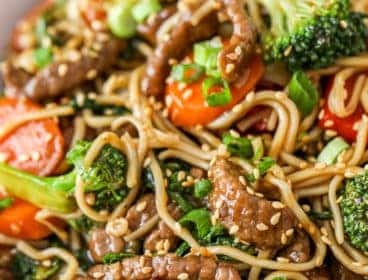 Mix all of the ingredients together except the canned mandarin oranges. Once combined I gently fold the oranges in as they can be fragile and break apart. Chill, preferably overnight which allows for the mallows to soak up any extra liquid. 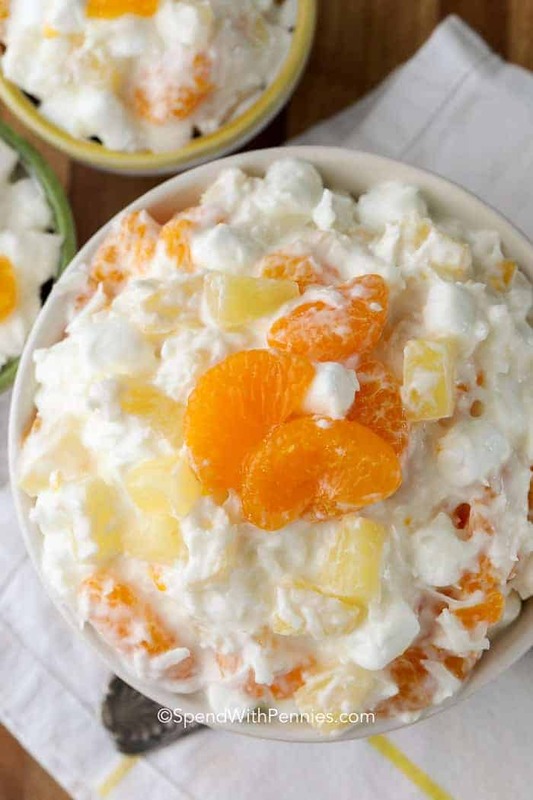 This ambrosia salad recipe is so versatile, you probably have all the ingredients in your pantry. 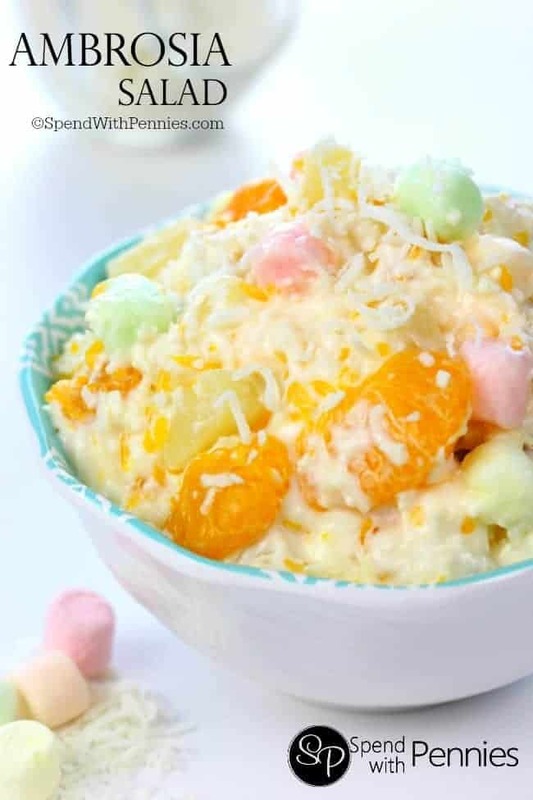 Keep on hand some canned pineapple, mandarin oranges, and a couple bags of mini marshmallows and coconut so you can whip up this elegant little dessert in no time at all! Who says you’re not ready for a last minute invitation? 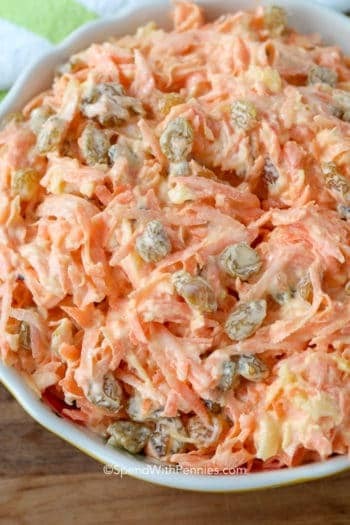 This is the best ambrosia salad recipe! 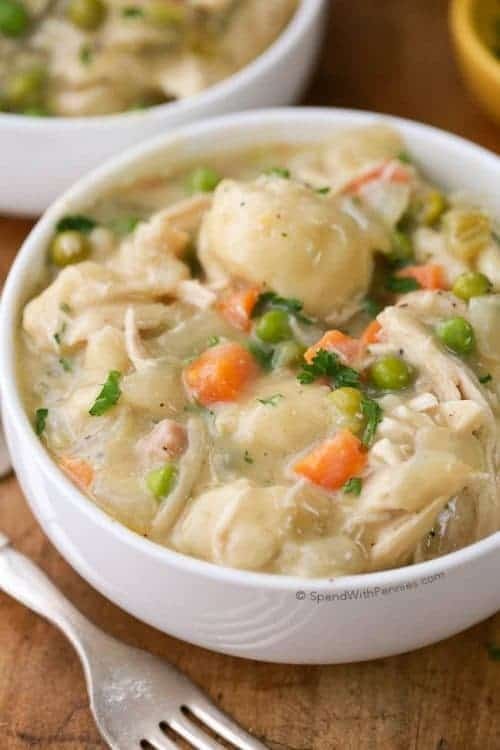 It’s pretty simple, not overly sweet and is something that can always be found at our holiday dinners! 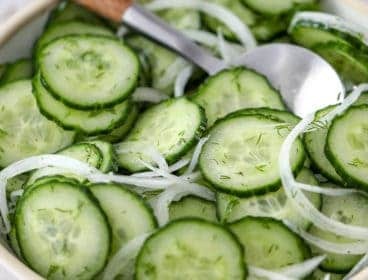 Fold together all ingredients in a large bowl. 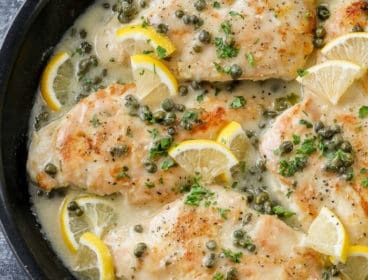 Refrigerate at least 4 hours or overnight.